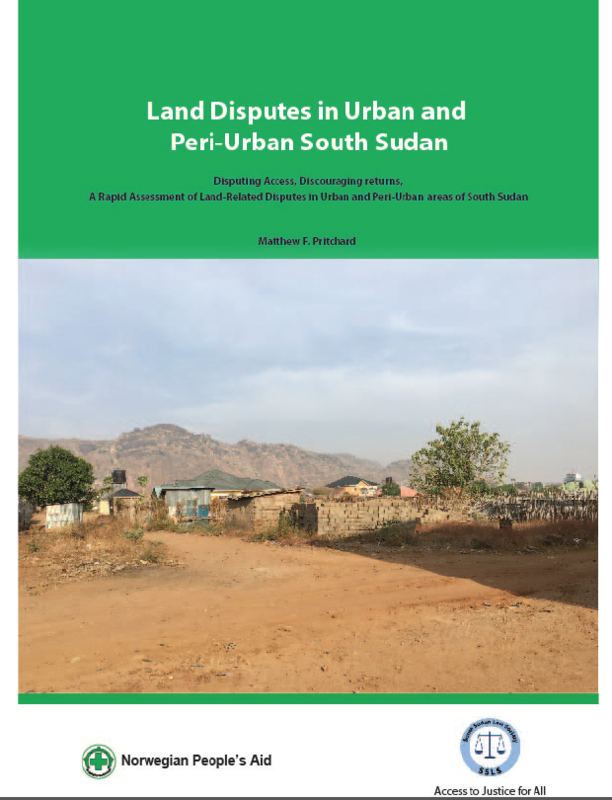 This report presents the findings from a survey of land-related disputes in urban and peri-urban areas of South Sudan. 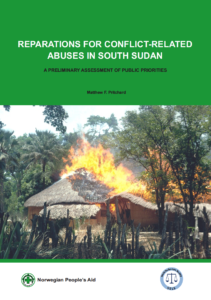 From November to December 2016, the South Sudan Law Society (SSLS), in partnership with Norwegian People’s Aid (NPA) and the State Land Alliances (SLA), interviewed 942 individuals in ten locations across the country. Findings from this study demonstrate that land-related disputes in urban environments are widespread, becoming increasingly difficult to resolve, and are re-enforcing demand for individually-held property registered with the state. In turn, growing demand for exclusive access to and control over holdings has amplified the stakes of housing, land, and property (HLP) disputes, as individuals and communities with different ties to customary and statutory authorities strive to entrench their rights. Although the Land Act, Draft National Land Policy, and key sections of the ARCISS Peace Agreement provide a foundation for land governance, a complete lack of implementation has resulted in an on-going legal vacuum which continues to undermine tenure security. Beyond exacerbating relations within and between households and communities, the inability to implement government-led reforms dramatically reduces the potential for large-scale sustainable returns of displaced populations, and undermines both livelihood security and economic development. Land and land tenure are essential components of post-conflict development. Fundamental to reconciliation, stability, and economic growth, access to land following protracted violence can present significant challenges to a peace process. The importance of land to peacebuilding and livelihood security is especially relevant in the urban and peri-urban areas of South Sudan, which experienced unprecedented growth following the 2005 Comprehensive Peace Agreement (CPA). The sheer size of returns and widespread rural to urban migration in an environment characterized by a lack of institutional and human capital led to extensive squatting and land grabs by an emerging political-military elite. Even before the outbreak of violence in Juba on 15 December 2013, land-related disputes in urban and peri-urban areas were pervasive and presented a significant obstacle to livelihood security and urban development. These obstacles have only increased following the outbreak of protracted violence and large-scale displacement, which have dramatically undermined socio-political and economic relations within and between ethnic and political constituencies. Given these challenges, the GRSS developed several pieces of land legislation that incorporate key aspects of what is currently considered to be ‘good governance’ with regards to tenure reform. Unfortunately, the 2009 Land Act has seen little to no implementation and the Draft National Land Policy has yet to be approved by the government. Although the inclusion of land-related legislation in the 2015 ARCISS Peace Agreement demonstrates (at best) a preliminary recognition that HLP rights are essential to sustainable returns, there has (once again) been little to no implementation of land-related reforms. If anything, the already limited ability of national and state-level institutions to manage urban holdings has been further undermined by on-going violence, continued displacements, and division of the country from 10, to 28, and now 32 states. Although formal sales have become increasingly important in urban areas, leaseholds purchased on the open market accounted for just one fifth of all holdings recorded in this study. The prohibitive cost of buying land on the open market forces the overwhelming majority of the population to access urban land through inheritance, customary law, and government tokens. This has dramatically increased the population pressure on peri-urban communities and provided additional incentives for community-led demarcation initiatives. Although community-led demarcation has increased the number of plots registered with the state, the ability of local powerbrokers to control the costs and necessary criteria for transferring customary holdings into individual-leaseholds undermines the already fragile tenure security of poor and marginalized groups who are generally unaware of, or unable to assert their rights. Regarding the ability of women to access and hold urban land, while evidence points to increasing acceptance of women’s inherent rights to property, there has been little change with regards to their ability to obtain and exert tenure rights independently of their male relatives. Despite equal rights to own land under statutory law, the overwhelming majority of women continue to access holdings exclusively through a father or brother. Although a small number of highly educated women in Juba have successfully registered plots in their own names, women continue to face several obstacles over and above the formal and informal costs and administrative hurdles associated with land registration under the government and community-led processes. Data demonstrate that land-related disputes are widespread and have generally increased in number since the outbreak of conflict in 2013. One third of all participants who have access to urban or peri-urban land were experiencing a land-related dispute at the time of research. Additionally, two-thirds of the entire sample stated that land disputes are common in their community. Exposure to conflict, displacement, and registration status have a significant impact on whether or not a household is currently experiencing a land dispute. Unsurprisingly, the prevalence of land-related disputes in urban areas has undermined feelings of tenure security and reinforced demand for government-backed registration. The main causes of land-related disputes are squatting, boundary disputes between individuals, and boundary disputes between communities. Independent of the cause, the majority of cases recorded in this study are between neighbours from the same ethnic group. 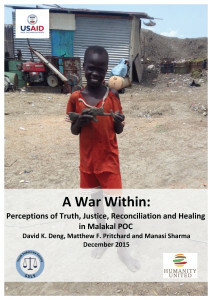 On the one hand, the fact that most land-related disputes occur between members of the same ethnic group has decreased opportunities for disputes to take on the ethnic overtones that have characterized wider-level violence since 2013. Unfortunately, given that conflict-related displacement has disproportionately affected members of certain ethnic communities, it is highly likely that large-scale returns will not only increase the number of land-related disputes, but also that these disputes will quickly devolve into conflicts over identity, autochthony, and ethnicity. On the other hand, although most disputes are between members of the same ethnic group, they have still had a negative impact on relations between parties. Disputes over documents, acts of property destruction, and physical violence are common, and have dramatically undermined intra-community relations. In addition to notable increases in the number of land-related disputes, data collected for this study show that these disputes have become increasingly difficult to resolve. On-going displacements and returns, the cost of dispute resolution, corruption, and breakdown in the authority of local chiefs have dramatically increased the obstacles facing effective dispute resolution, and dramatically reduced incentives to seek assistance from customary and statutory authorities. 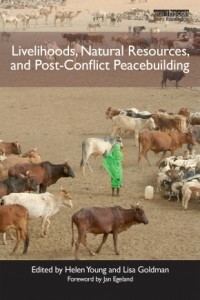 The current inability of customary and statutory mechanisms to address land-related disputes presents a number of challenges to tenure security. These challenges will increase exponentially with the return and resettlement of hundreds of thousands of IDPs and refugees into highly politicized urban environments characterized by widespread squatting, looting, and property destruction. Although there is a pressing need for the GRSS and supporting partners to implement the Land Act and National Land Policy, the priority in the short and medium term should be on resolving on-going and emerging disputes. While progressive land laws are an essential component of urban reform, any changes to land access, use, and management systems will only be as effective as the customary and statutory mechanisms of dispute resolution that underpin them.